Is coming out becoming so normal that it’s not worthy of “insane” media publicity and high production values? After Anderson Cooper and Frank Ocean recently came out to much fanfare, fitness guru Shaun T quietly slipped out of the closet this weekend via a simple retweet. Shaun T created Insanity, a 60-day program focusing on “maximum-intensity exercise with short periods of rest.” The program promises fast results without leaving the house and has been wildly successful. Shaun T followed up his continuing success with the “Hip-Hop Abs” video which had men and women swooning across the country. And that was that. A simple and sincere moment captured via Instagram and Twitter to two newlyweds! No product tie-ins or advertising blitz. 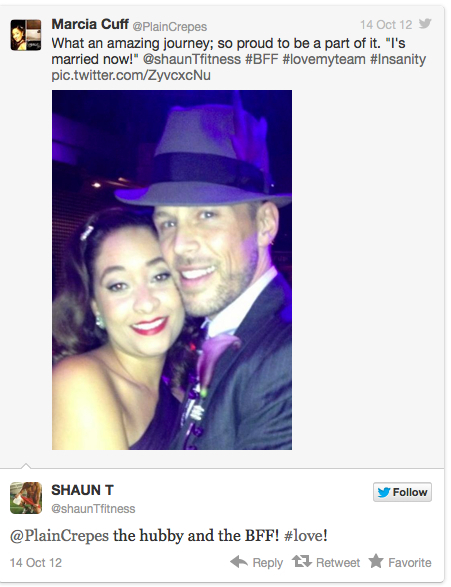 Congratulations to Shaun T and his new husband Scott Blokker! We wish you the all the best in your new life together!